David Mas Masumoto has authored a wonderfully touching story of a Japanese-American family in the central valley of California. Prior to farming, along with other West Coast Japanese-American families, the Masumoto family was relocated to the Arizona internment camps in the early 1940s. They endured many hardships, but eventually were able to return to California and small farming. $9.85. Despite hardships, the family (David’s grandparents and parents) was able to purchase a small farm and there the story of “the family farm” begins. The history of growing grapes, peaches and other stone fruit in the central valley is intertwined with life and death on the farm. Today, David, the main character, has taken over the stone fruit farm started by his 77-year-old father. 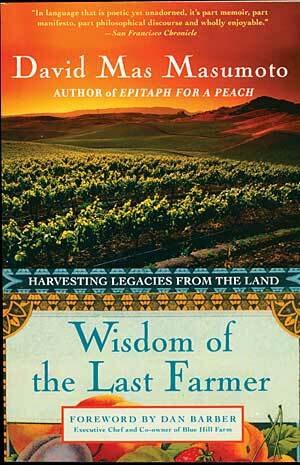 There are few books that juxtapose life, living and farming in such a direct and poetic way. The book is purely enjoyable to read. Softcover, 238 pages plus additional interviews. Originally sold for $17.99, now as a remainder through the N-News, only $9.85 plus s&h.